Well, this book has answered the question, “Would I have wanted to be a samurai?” No. The book reads a little more like the Analects of Confucius than Buddhism. One of the main thrusts is not so much that obedience is the cornerstone of an orderly society from the peasant to the emperor, and that obedience includes being a good man taking care of his charges. Instead, The master is all. The retainers must live and die at their master’s will, and they (the samurai) must think and live only to die well in the service of their master. Well, you can see why I, as a twentieth century American (trapped now in the twenty-first century) would chafe at this sort of worldview and instruction. In the generation of Lord Katsushige there were retainers who, regardless of high or low rank, were requested to work before the master from time to time when they were young. When Shiba Kizaemon was doing such service, once the master was clipping his nails and said, “Throw these away.” Kizaemon held them in his hand but did not stand up, and the master said, “What’s the matter?” Kizaemon said, “There’s one missing.” The master said, “Here it is,” and handed over the one he had hidden. So you’ve got a lot of stories of good retainers and bad retainers designed to illustrate the code of conduct for samurai, but basically the moral code comes down to It’s Good if the Master Doesn’t Kill You For It, which is sometimes lopping off someone’s head and sometimes not lopping off someone’s head in similar circumstances. You’ve got some tips makeup tips (always carry some rouge in your sleeve for those times when you’re hung over and need to improve your complexion), tips on homosexual relationships among the samurai (the younger man should make the older man wait five years to prove he’s not fickle), tips on etiquette (never be seen sneezing or yawning), tips for removing faces, and admonishments that samurai should not be Buddhists. There are some quotable bits that make sense, and I did learn some things about feudal Japan that I did not know, especially about seppuku which is discussed heavily throughout the book. I learned the word for committing seppuku when one’s master dies (tsuifuku), and I learned that often the one performing seppuku had a second of sorts whose job was to decapitate the seppukee after the seppukee opened his bowels. And that many samurai didn’t want the job because it was shameful to perform it poorly. And that some controversy existed as to whether it was better to completely sever the head or to leave a little flap of skin so that the completely removed head would not bounce around undecorously. So I learned some things, but not useful things, and certainly things one can drop into conversation with normal people. Still, I’m glad to have read it to get a better sense of what samurai thought of themselves. 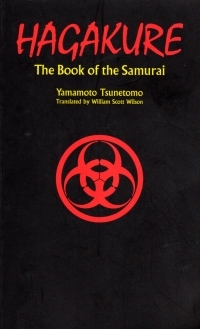 The author was a samurai who did not commit tsuifuku when his master died because his master wanted him to live. He eventually became a Buddhist monk as he wrote this bit of historical reflection. Many times as he’s telling the stories, he says that the kids these days are softer and weaker than the samurai in the good old days. Apparently, the book is an excerpt from the original(s), but I don’t think I need to learn Japanese to read the rest. Worth a read if you’re into this sort of thing, but it is not a self-help book by any means. It took me two football seasons to make it through this book. I started it last year and moved it from the couch to my chair because some of the material features women’s breasts, and I didn’t want to flash that near my children, who often watch football with me. Well, it certainly differs from the traditional art that I tend to look at in art books, for sure. Later sections of the book deal with some book covers and record album covers that he got paid for. 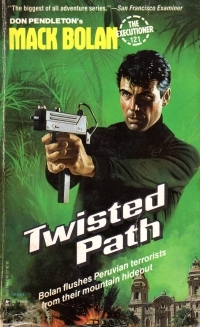 Most of the book covers are for science fiction books, including a lot of Michael Moorcock, but also a number of Dash Hammett books, which doesn’t seem that they would yield themselves to that sort of thing. But the 1970s were a different place, man. So, not my thing, and this guy made a go of it, so someone liked it. The field of social psychology is sometimes accused of doing no more than ratifying common sense, so it’s worth paying attention when its findings are genuinely surprising. Case in point: the discovery that when we are rewarded for doing something, we tend to lose interest in whatever we had to do to get the reward. Psychologists often distinguish between intrinsic motivation (wanting to do something for its own sake) and extrinsic motivation (for example, doing something in order to snag a goody). The first is the best predictor of high-quality achievement, and it can actually be undermined by the second. Moreover, when you promise people a reward, they often perform more poorly as a result. Weird, but that’s what all the literature and culture has told us is the way to raise our children. And look where that has gotten us as a society. Maybe it’s the same people who have been in charge of official nutrition and dietary advice. The night before last, my beatiful wife awakened me. I had retired before she did, and before I went to bed, I started the dishwasher. As she was sitting downstairs, she heard the sink in our bar gurgle, and water was coming up the drain. So I raced upstairs to turn off the dishwasher which drained the dishwasher instead of helpfully pausing it, but we managed to get a bucket and bail the sink before too much of the water ended up on our floor. And it brought to mind a little ditty by Paula Abdul. The solution for a clogged drain like this is to panic to run a cable augur, also known as a snake, into the pipes to bore through the obstruction. The kitchen and bar sink are on the north side of the house, and the wastewater exit is on the south side of the house. The showers, bathrooms, and laundry equipment were draining fine, so I knew it was in the line running from the north side of the house to the south side of the house. Now, I have a small augur that fits on my drill and has a couple feet of cable in it, but it’s a long way to go to the south side of the house, so we called for a plumber to come out and run a real auger into the plumbing. You know, it’s the first clog beyond the p-trap that we’ve had here at Nogglestead. Contrast that with our experience in Old Trees, where we lived for three years: We had the drain guy out so often, we were on a first name basis with Rick and knew a lot about him (his favorite hobby and prized possession was his monster truck which he took to events and children’s hospitals). Back then, it might have made sense to buy a full-sized auger, but if we’re only going to need to use it once a decade, it would take fifty years or more to pay out versus calling a plumber. So no cool new power tool for me. Just an increased watchfulness on the drains to see if they’re draining slowly because now I know that a back-up is an actual possibility from direct experience, as well as a sense of relief that we caught the back-up before the dishwasher went through its whole cycle and made a real mess. And an excuse to run a Paula Abdul video. 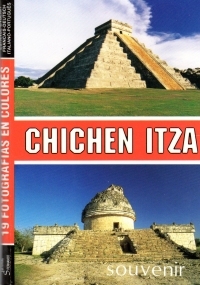 I bought this book and little fold-out collection of pictures in 2016, and it’s taken this long for me to get to it because the book contains a bunch of poorly written text around the few full-color photographs of the ruins in Chichen Itza, which means it has gone almost a football season and a half wherein I could not browse it during games, so I finally just set it on the side table to finish to bolster my annual read books number from 2018. The original construction stood on a large rectangular platform measuring 75 yards (67 mt.) from north to south, 55 yards (52 mt.) from east to west and 21 feet (6 mt.) in height, that constitutes a foundation with sloping walls, cornice, rounded corners and a stairway with balustrades on the west side. On it, a cylindrical tower about 50feet (16 mt.) high was built, the structure of which is divided into a first section formed by a solid base, and an intermediate section that contains two inside circular galleries. Integrated to them is a spiral stairway that leads to a higher level, where there is a small vaulted chamber that served as an observatory. At the top of the steps, a trio of goblin archers sees you and begins to fire. Roll for initiative. Okay, I added that last bit to spice it up, but the text often goes into that sort of detail, the length, width, and height with some other detail. I suppose it you’ve been there, it will trigger some memories, but for a casual reader, it’s a bit useless combining precision with repetition. Also, the book has numerous typos and/or alternate spellings. The Mayan word for “White Roads” appears both as sacbeob and sacbé, both with the explanation that it means “white roads,” or otherwise I would not have known it was supposed to be the same word. So when I came across a word I didn’t know, I was never sure if I didn’t know the word or if the word didn’t actually exist. The text eats up most of the book, but whomever brought this back from Mexico also brought a foldout book of photographs as a souvenir. 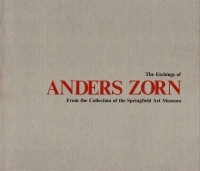 It looks like a collection of post cards, but the back is filled with the photo caption in six languages. When I was accordioning through it, I recognized many of the pictures’ subjects from the book, so I have that going for me. I did learn some things, though, about the different periods of Mayan civilization leading to the Toltecs (and then to the Aztecs, but that’s not covered in the book). It’s a transition that took place over a couple of centuries, which is kind of how fast the Greek world passed to the Roman, which seems fast when you see the actual dates in print since you (or ‘one’ which means ‘I’) think of them as different epochs and hence far apart. I do wonder, though, about some things. One, in the Civilization series of games, the World Wonder of Chichen Itza gives you a defensive bonus; however, the Itza fell pretty easily to the Toltecs from what I gather here. 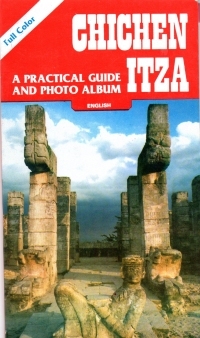 Also, the book explains how advanced of a civilization (not the game, but you know, civilization) the Mayans were, but I’m a bit of a cultural chauvanist. 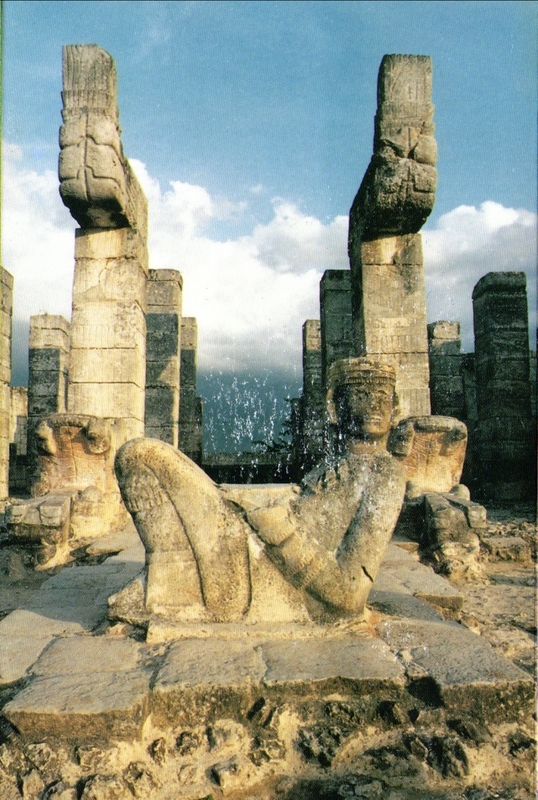 They don’t have many written records from the height of their civilization which runs from 300 AD or so to 1200 (the end of the Maya-Toltec period), and they thought that throwing human sacrifices into their water sources for good luck was a good idea. Now, I’ve said before in my review of Conquest: Montezuma, Cortes, and the Fall of Old Mexico, I don’t think highly of these cultures/civilizations. But that’s because I’ve learned about them. I’m glad to have muddled through this particular book. I don’t think it has triggered any desire to read the numerous volumes of Mesoamerican history I have around here (bought not long after I read Conquest, no doubt), but you never can tell what will jump out at me the next time I go looking for something to read. Apparently, there is a football player whose name is Will Fuller V.
Which like so many other things, I own on vinyl. In this case, a 45 that my sainted mother bought in her youth. This is not the first nominal tie-in book to the television series Downton Abbey (which I famously gave up on). That honor falls to Downton Abbey Rules for Household Staff. 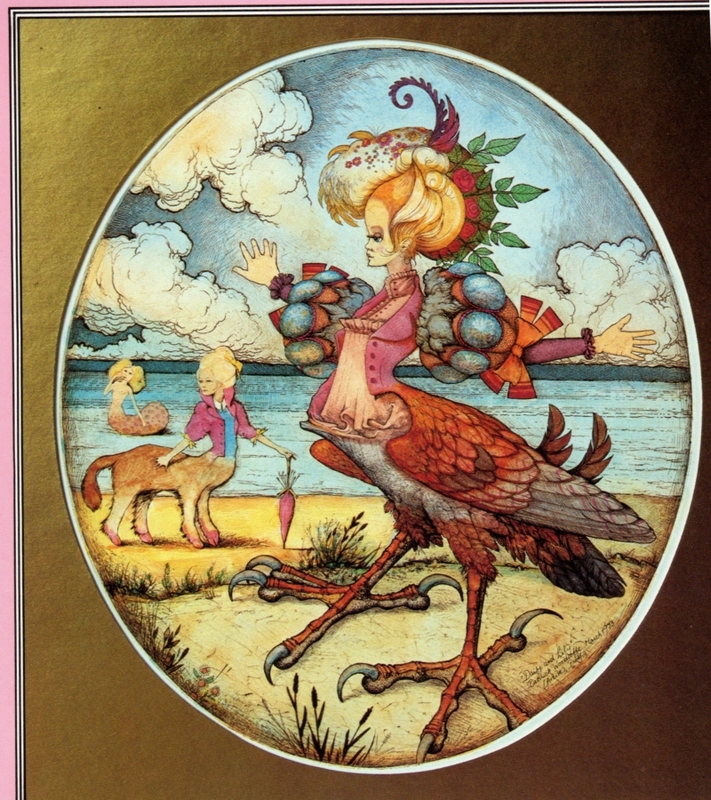 This is the first humor book, though, and might be the last. But it has cats in it. 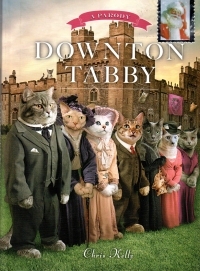 At any rate, the book is a purrported parody of Downton Abbey using cats as stand-ins for the characters in the television series, coupled with some manipulated photos of cats reenacting some of the scenes with a pithy punchline. It’s not very long, but the joke is carried a little far even then. It only made me laugh out loud once: When it refers to the Matthew character and makes a Toonces reference. The rest of it, meh. Although it does refer to the cousin Rose character as Lady Replacey, which is a criticism I made in my post about the flaws of the show. At any rate, worth a browse if you can find it for a quarter or something. If you cut a face lengthwise, urinate on it, and trample on it with straw sandals, it is said that the skin wil come off. This was heard bny the priest Gyojaku when he was in Kyoto. It is information to be treasured. It is also information to be woven into your nightmares. It’s one of the listicles that PJ Media is trying to become famous for, but here at MfBJN, it’s a quiz: The 10 Most Bizarre Hits of the ‘70s. How many does Brian J. have on vinyl? I thought I did better because one of the entries mentions the Chipmunks’ “Christmas Song” which I have on single and probably on a Chipmunks or Christmas album somewhere. So that’s 33%, or better than I do on coffee house-based album cover quizzes. Brian Drake (no relation) has a letter from gun writer Jerry Ahern to Gold Eagle about Mack Bolan’s weapons. Many of the suggestions I’ve probably remarked on in individual book reports as wrong!. McIntyre joined Carrillo. “As we agreed. Twenty cases of M-16s, ten cases of M-60 GPMGs and a hundred fifty cases of 7.62 mm ammunition. I was all finta go full Nelson Muntz “Haw, haw!” on it publickly and say, “That ammunition doesn’t fit in either gun!” But then I realized I was mistaking the M-60 for Ma Deuce, and the M-60 is chambered in 7.62 after all. This book is better than the preceding installment (Border Sweep). In it, Bolan gets tapped to find out who killed an FBI agent who was investigating a weapons manufacturer who might have been sending a few shipments of military-grade weapons to a South American gun runner. Bolan does, but he gets the dirty executive to give him the contact in South America. Which leads to Bolan to Peru, where a trap has been set for him that sends him to a dark Peruvian prison, where his only hope for escape lies with members of the Shining Path–members he hopes to eliminate when he gets out. It has more of an original Bolan flavor than Border Sweep with some philosophical asides that are a little like Pendleton used to do, but it’s not a completely flawless effort. Still, it’s better than the one before it and gives me hope that, when I take a break from other things with one of these books, it won’t be a complete waste of time. Why are so many musicians into the “thundering paw,” and are human sacrifices involved? Why is the press not covering this? As I said when I bought the book, you could expect me to take a look through this book immediately while nominally watching a football game. Watching football these days really does just provide a pretext for me to sit on the sofa in front of a fire and browse great works of art. Also, to cheer for whatever team is playing the Bears, even the Patriots. This book is an oversized (which is just right sized for art books, if you know what I mean) full color collection of Cassatt’s work from the different eras in her life (Early, Impressionist, Mature, and Late) and has a little bio of her at the front. I laughed at the beginning of the bio, when it says that she came from a middle class family who spent years travelling in Europe and had horses. In some places, middle class means “merchant,” and her father was a stock broker with a pile of money, but that’s not upper class, lovey. Somehow. I think Cassatt might fall between Renoir and Manet as my favorite Impressionist. Even in her Mature and Late post-Impressionist pieces, her soft lines and brush strokes evoke memory as more straightforward and unabashedly Impressionist pieces do. Cassatt, it must be noted (and will be again when I report on the other book on her work I have), was the only American included with the Impressionists. Fittingly so. I bought this book at Library Con this year, and it was foreordained that I should read it soon. One, I’ve been reading a little more science fiction this year since I’m hoping to gut out a science fiction novel in the next year or so and because I’ve been dabbling in a little short speculative fiction (well, ideatating some, which means writing down story ideas on note cards) since reading The Twilight Zone Encyclopedia earlier this year. Two, the book came with a bookmark and a business card with the book cover on it, and I’ve been using them in my other books. Which subtly told me I need to read this book. All right, what’s it about? It’s a high-level intrigue kind of book. One of the vice president admirals of a galactic(?) government is building a team of pseudo-mercenaries including: a man from ancient Earth who has been in suspended animation for a long time; a telepath; a rescuee from a rockslide on a dead-end planet (and her sister, sort of); the remnant of a race of highly analytical aliens; a shape-shifter with his own agenda; and a couple of other people who don’t get their own perspective chapters. The galactic government is pitted against a militant shark-biped race whose ancient religion is compelling them to conquer and to cleanse the universe of non-sharkmen. An aggressive human (called Osirians because Earth was populated by Osiris, who was really an alien banished to a backwater planet for reasons not yet revealed) captain is ready for a pretext to ignite the war and his political career with it. And some alients are working to translate the sacred language of the sharkmen knowing that being caught means torture and death. So it’s a very busy work to say the least. Unfortunately, that makes it difficult to get into. 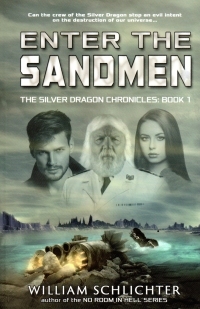 The book hops chapters between characters, starting with the woman rescued from the rock slide, and then we hop to the Captain, a swordsman trained by a martial alien race. The book is chock full of mysteries from the outset, and some get resolved, but more get brought up, and then the book ends after a battle (triggered by the politcally motivated captain above) resolved by the vice president admiral bringing his alien race into alliance with the Osirans and their sponsors. A big whopping universe like this really needs a sympathetic, grounding character that provides an in for the reader. Perhaps a n00b that other characters can feed exposition or who can discover the mysteries. 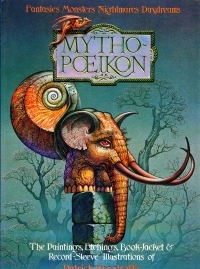 This book doesn’t have that, so the reader has to pinball amongst a grandly designed mythos and hang on as best as he can. So the book grew on me, but it took a while. I’ll probably see this fellow at another convention sometime and pick up the next in the series, but I’m not so eager for it that I’m going to order it online. I need to see other books for a little while. On Tuesday, I helped set up for this sale, which meant I unboxed the books for the Art tables and sorted the Animal books by animal type. Little did I know that those who volunteer on Tuesday get to shop immediately when the book sale is set up. So I didn’t have my checkbook, but I wanted to wait until half-price day anyway. So we did make our way up there yesterday, and we spent less than a hundred dollars, but only because it was half-price day. The Many Faces of	Sammy Davis, Jr. I did buy a couple I already owned because they have better covers; I also bought a couple that I think I might have, but wasn’t sure, so I bought them just in case. I did buy some new to me artists, though, such as Frankie Carle and The Three Suns, so I might have discovered something I really like. What I have re-discovered, or soon will, is that I need to build some record shelving, stat. I got a couple of Great Courses/The Teaching Company/Modern Scholar courses because this FOL sale priced them down. Instead $30 / $15 on half-price day, these courses were marked like $5 / $2.50, so I bought a couple even though I bought a bunch of them last weekend. Laura Ingalls Wilder, a biography. The Shepherd of the Hills; I have a very old printing of this Harold Bell Wright classic (especially near Branson), but they’re not reading copies, and I have not read this book since I was a kid. Wait, I probably already have a copy; I know I have a copy of The Clinch Hollow Story, which was written by the long-running actor who portrayed the Shepherd in the play of the same name. Croutons on a Cow Pie, poems by Baxter Black. I have a couple of his novels around here, but I am pretty sure I’ll get through this thin collection first. So there we go: With the dangerous book sale season behind us, I’ve not bought more books than I can read in a year. But I should probably jump on them quickly just the same. I am most eager to delve into the art books first as I kinda watch football games, so you can probably expect to see some twee commentary on Cassatt this week. So I was listening to the radio in the car the other day, and I announced to my children that the song on the radio was my favorite .38 Special song. The song? “Hold the Line”. The problem? That’s Toto, not .38 Special. A defense such as it is. At any rate, it comes to mind because today is Friday, which is a holiday (albeit different from the Friday holiday celebrated at Dustbury). On Friday, Leo at Frog Leap Studios releases a new metal cover. Previously, of course, he had done Toto’s “Africa”. In my defense, I have not (yet) mistaken Toto or .38 Special for Poco, but that time is coming, no doubt. 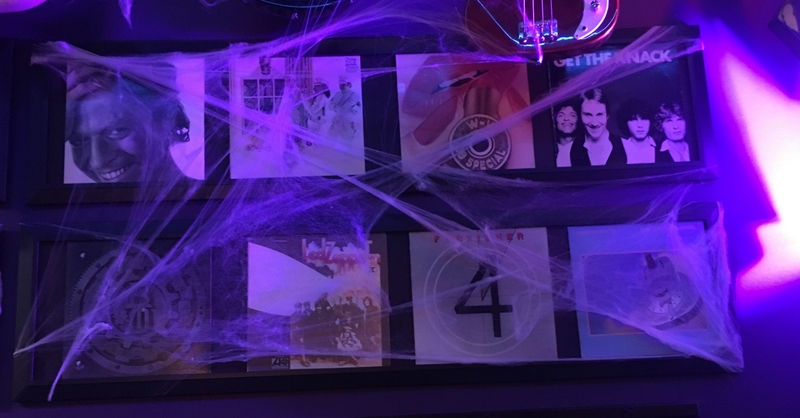 Yesterday, I had a second opportunity to kill some time at the Classic Rock Coffee shop after dropping my kids off at school, so I sat at another booth and snapped a picture of the album covers on the walls. Okay, so that’s a whopping 0 out of 8. Apparently, I am a classic rock poser. I didn’t even recognize two of the covers and couldn’t make them out. This would probably be easier in any month but October without the fake spider-web decorations. 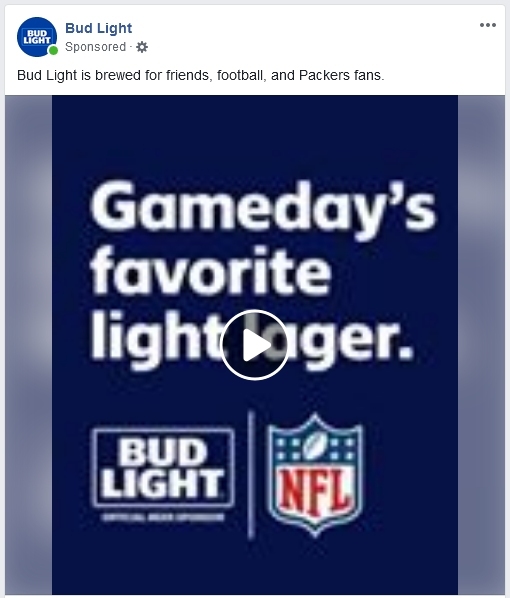 In my defense, I once saw BTO in concert at Summerfest. Also note I do have greatest hits collections from Foreigner and BTO, so I have the hit tracks from each album in my personal collection. As I mentioned, 25% is likely to be the ceiling for my scores in these quizzes. If you recognize one of the album covers I couldn’t identify, leave it in the comments, and I’ll correct it in the list above. 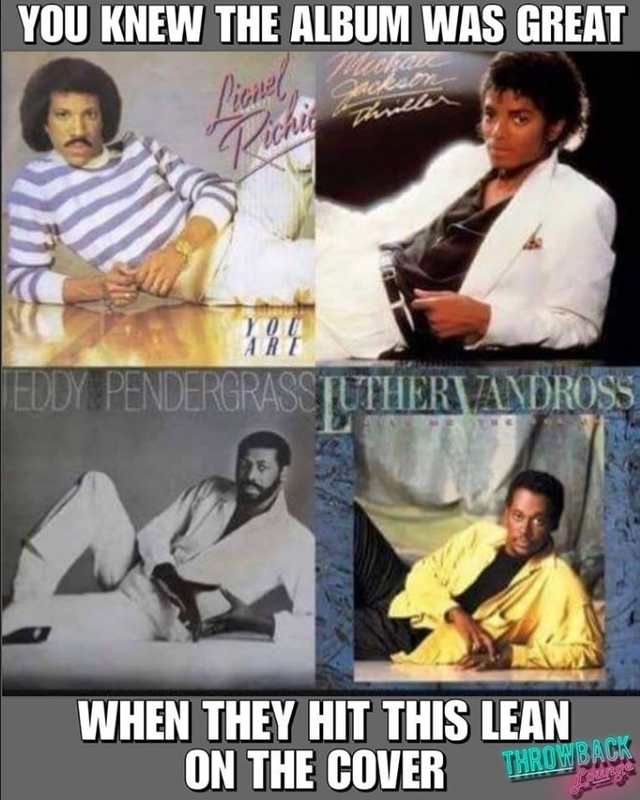 I won’t likely correct it in my music collection, though. UPDATE:Thanks be to Friar for supplying the missing album titles. In unrelated news, he titled his post today after another classic rock album.